New voting equipment and enhanced cybersecurity protections make up nearly two-thirds of total investments detailed in state narratives and budgets submitted to the U.S. Election Assistance Commission (EAC) following the appropriation of $380 million in new Help America Vote Act (HAVA) grants. The EAC today released narratives and budgets for 48 of the 55 states and territories that have received a portion of new funds appropriated in March 2018. Seven remaining states have requested extensions and will be released at a later date. “Just five months after Congress appropriated these vital funds, states and territories have money in the bank and new plans in place to protect the security, accessibility and efficiency of federal elections. The EAC is a proud partner in this accomplishment and we are pleased to share narratives and budgets that detail the impact these funds will have across the nation,” said EAC Chairman Thomas Hicks. The state and territory narratives released today contain expenditures for items such as personnel, equipment, awarding of sub-grants, training and improvements to accessibility. Many of the documents also contain information on how grant recipients will comply with statutorily required activities, such as the required 5 percent state funding match that must be made available within two years of the start of the grant award. According to the narratives, the vast majority of states and territories plan to spend their allotted funds within the next two to three years. Each funding recipient is required to file a standard Federal Financial Report and updated program narrative for each fiscal year and may be audited by the EAC’s Inspector General. The first Progress and Financial Reports from states and territories are due to the EAC by December 31, 2018. The $380 million in funding signed into law on March 23, 2018 marked the first new appropriations for HAVA funds since FY2010. 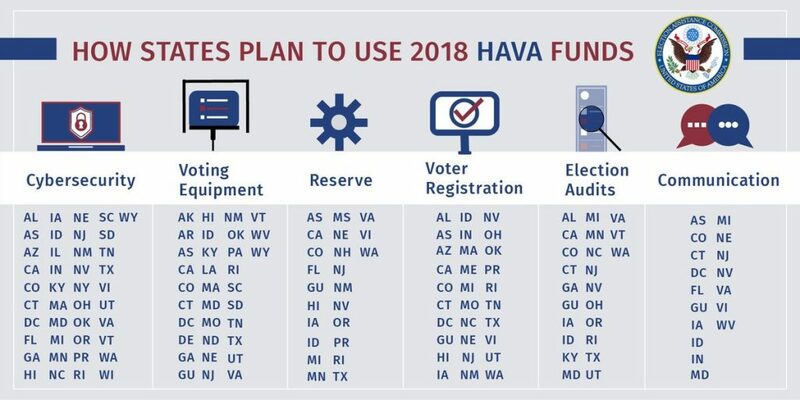 HAVA funds were designated to improve the administration of elections for federal office and allocated to states using a voting age population formula described in Section 101 of HAVA. For a complete list of each state and territories allocation, please click here. The EAC sent all eligible states and territories grant award notification letters in early April less than a month after the Consolidated Appropriations Act of 2018 was signed into law. The letter allowed states to incur costs, with prior EAC approval, against the forthcoming grant awards, effective the date of the notification letter. Funds were then available for states to draw down and deposit in their state election accounts after they returned signed grant documents and the required certifications and assurances. By July 17, 100 percent of state funding request letters had been received. To date, 96 percent of the funds have been disbursed to the states. The remaining 4 percent still await state resolution of administrative issues related to their U.S. Treasury accounts. The EAC has always been a valuable source of details on state HAVA spending – but I suspect this latest batch of data will get extra attention given the current debate on Capitol Hill and across the nation on what, if anything, should be done next. Stay tuned! 1 Comment on "EAC Releases Details on States’ Plans for Spending New $380M in HAVA Funds"
to post your articles or internet sites. Follow these guidelines and these types of do all right.